Everyone is looking for clues as to what works and what doesn’t–especially with the essays. Often, the risk-takers seemed to prevail. Over the last month we’ve had Ziad and his #BlackLifeMatters essay; the Quadruplet’s package deal; and first-gen Cassandra Hsiao’s piece on her broken English. Does this mean you should take a risk with your essay? The reality is what works for others most likely won’t work for you. In fact, it could backfire. Ziad and the Quadruplets Took a Creative Risk With Their Essays–And Won! I loved the article about the quadruplets who teamed up on their applications–and essays–and got into Yale and Harvard–as a package deal. This was clearly a calculated risk that paid off big time. “In a clever stroke, the four brothers wrote essays that can be read separately, yet are meant to be read together, like four pieces of a puzzle. Each piece is charming and winning on its own, but together, they are even better, and college admissions officers everywhere seemed to agree and were unwilling to pull them apart.” From the New York Times article. This showed me that colleges and schools can be open-minded to creative admissions approaches, but only if there already are solid reasons they want those students. Just this week, an American-Muslim teen who fights for social justice named Ziad Ahmed made headlines after getting accepted to Stanford University using a college application essay that included only the same hashtag phrase #BlackLivesMatter a hundred times. A controversial essay about a controversial subject. What does that say about these essays? What does it say about crazy-competitive colleges, such as Stanford? Some college admissions industry pundits were handwringing, saying this out-of-the-box essay proved the essays don’t matter. To me, it shows that taking a risk can pay off with these essays, mainly because so many of them say the same thing in the same way, and college admissions officers can’t help jumping at otherwise exemplary students who find a unique way to express themselves. Should you take such a risk? Should you write an essay and only include one phrase 100 times? It worked for Ziad because he is the one and only Ziad, and this one and only essay perfectly reflected something unique and fundamental about him. You aren’t Ziad, so it won’t work for you. And keep in mind that his essay also somehow perfectly complemented everything else he showed Stanford about himself in his application, and I’m guessing that was a pretty impressive package. If you decide to take a risk with your essay, it must be consistent with who you are and accurately reflect your individuality and also be consistent with your entire application. Copying the risk someone else took will not work. Other risk-takers can inspire and give you ideas, yes. But what you decide to write in your essays must come from your authentic self. If they don’t, they could hurt you. That’s the last thing you want. Remember, colleges use these essays to round out their picture of you from your complete applications. If you are a more conservative, head-down, follow-the-rules kind of student, perhaps your essay should reflect that style when it comes to your topic. And be more conventional. If you are bold and idealistic, and have a whacky side, it might make sense to do something out there, like Ziad’s topic. Over the last decade, I’ve seen all types of topics help get students accepted. There was the boy who wrote about stealing a baby goat. And getting caught by the cops. I’ve seen students write essays on topics that are often red-flagged as cliche or overdone—such as the death of a parent or a sports injury or a mission trip—land their dream schools. I believe if the topic is true to what that student wants to showcase, and enhances their admissions self-portrait, almost anything goes. Some students have faced horrendous hardship in their lives, which has helped define who they are. Often, it’s a wise idea for them to write about those personal challenges. Others, however, have yet to face many intense personal crises or challenges. In the past, I had to work hard to convince students and parents that writing about “mundane” topics was NOT taking a risk. I believe recent feedback indicating that these types of essays are effective has confirmed their power. This season, another brilliant student, Cassandra Hsiao from here in Orange County, California, got into all the ivies with her essay on an “everyday” topic–her struggle learning English. I also believe that getting into a bundle of top colleges, even all the ivies, does not necessarily prove the student’s essay was exemplary. Many times a school decided they wanted a student based on other qualifications and attributes, and the essay played no role. I probably was in the minority, but I thought the essay written by Kwasi Enin, another brilliant and talented student who got into all the ivies in 2015, wasn’t that hot. In fact, I thought it was on the dull side. As you can see, it’s almost impossible to figure out how much the essay mattered in all these celebrity acceptances. The only certainty is that these essays did not nix their chance of acceptance. Beyond that, we are all only hypothesizing. For some, the essay can tip the scale in a student’s favor. For others, it might not have mattered at all. 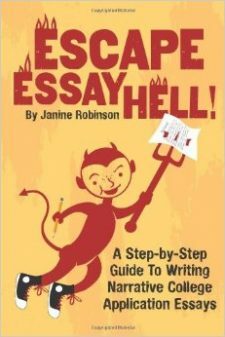 All you can do is write your best essay, really. Should YOU Take a Risk with Your Essay? If you are considering taking a risk with your essay topic, however, think hard about why you are doing that. If you are going to a super competitive college, and know you have outstanding stats, maybe it makes sense to step out of the box a bit in an effort to make an impression. Remember, all of the students who got into multiple ivies had off-the-charts stats, such as near perfect test scores and grades. Do your due diligence and research your target schools so you have some idea of what type of student they are looking for, and try to line up the tone and topic that best shows why you are a fit. If you don’t want to mess around gaming the whole process, stick to finding a topic that highlights what makes you tick, and trust that will help you best land where you belong. I like that approach the best, frankly, no matter what college or university you want to attend. THIS PAGE has my best posts to learn exactly how you can find your own unique topic and ace your essay, risk or no risk. Go with what works best for YOU!